If you have a visit with your Weatherford dentist coming up, get ready for a truly different dental experience. We are pleased to offer the most advanced care with high-tech tools like the intraoral camera, which lets you get an up close and personal view of what’s going on in your mouth in real time. Using this small handheld device, we transfer crystal clear images of your teeth and gums onto a chairside screen so our team can carefully explain the details of any proposed treatment plan. Even better, it also allows us to catch issues almost as soon as they develop for a more conservative treatment plan overall. Want to learn more about the intraoral camera? We’ve got the facts in this week’s blog post. In dentistry, a picture is worth a thousand words. It’s hard to have a conversation about your oral health if we can’t show you exactly what’s going on — we want to let you see precisely where you may need a treatment, and why. Our small handheld mirrors only go so far. The intraoral camera solves the problem. It’s a small tool that is hooked up to a screen located right at your chairside. Your dentist or hygienist runs the camera over the affected area, showing you in clear images just why you need a proposed treatment. 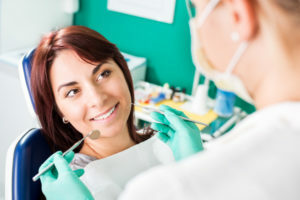 In addition to letting you see inside your mouth, the intraoral camera also allows your dentist to get a magnified view of your teeth to catch potential problems earlier than ever. Issues that may otherwise go unnoticed — like cracked teeth, small cavities, old, leaking fillings, and other problems — show up sooner on the intraoral camera. And whatever’s going on, early detection helps us ensure you receive the most conservative treatment possible. We know successful treatment plans require, first and foremost, informed patients. Only when you are armed with all the knowledge can you make the smartest decisions for your oral health. You’ll find it’s easier to ask informed questions when you can see the inside of your mouth in real time right in front of you, and that means you will never leave our office with any doubts surrounding your oral health. Plan to Visit Your Family Dentist in Weatherford! When you visit a dentist who makes use of the latest in technology, you are making a wise decision for your oral health. If you’re interested in benefitting from high-tech dentistry in our neck of the woods, look no further than the team at Cosmetic & Family Dentistry! Contact us to schedule an appointment today. by: Dr. Deborah Romack at June 18, 2017 .